Nearly 300 unique tones or settings, this is the ultimate resource for rock and metal guitar. 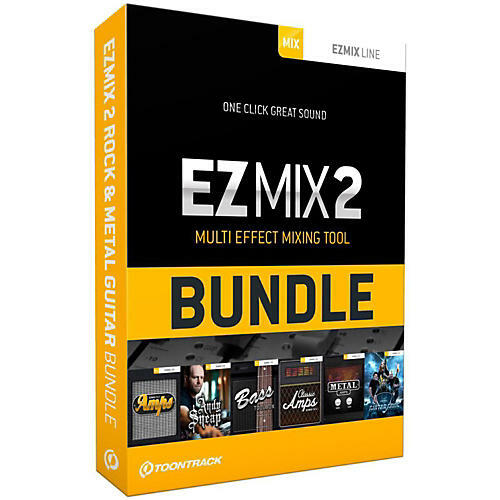 This bundle combines the powerful multi-effect mix tool EZmix 2 with six individual expansion titles, all centered around rock and metal guitar. With nearly 300 individually crafted tones for bass or guitar, it's not only a near incomprehensible well of material, it's a historic document of amps, speakers and tones through the ages. All guitar settings were either directly modeled from original amps and speaker cabinets or designed as custom settings, featuring several layers of processing detail. From the classic rock amps of the mid '60s and on, through the essentials of bass guitar and all the characteristic high gain tones of the past two decades of metal. Add to that more than 40 settings directly modeled after some of the most noted productions in metal superstar producer Andy Sneap's catalogue as well as a generous batch of tones personally designed by four of the most iconic and trendsetting guitarists in modern metal. All that in one package of unparalleled creative power. This combined with the more than 300 mix settings included in EZmix 2 gives you a near incomprehensible amount of tools for your general mixing needs, your vocals, drums, mastering and above all - guitar and bass tones.